Trigger content that supersedes predefined programs. Need to display emergency messages, amber alerts or other time sensitive information? The QL Trigger SDK can handle all your instant notification needs. Launch any content or playlist instantly from an external trigger. Content triggering is based on external data, keypads, sensors, Kinect or third party software. Display any type of emergency message instantly and then easily revert to regular scheduling. Designers can use various types of sensors, keypads, data or third party software to trigger any content in QL. 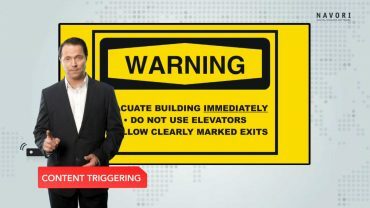 QL Content Triggering is available for Windows PCs and Android devices/tablets. Trigger content operates on any display configuration including video walls, in any location. In addition to a playlist that is scheduled, it’s important today to trigger content on demand. Navori QL Player offers an API to do so. You can integrate and trigger content from things like an emergency notification system, a sensor or even a physical button. Here’s an example. You can see immediately the evacuation media comes up. Let’s look again. We’re back on the video. I push, and again. Use the QL Trigger SDK to develop customized audience experiences that will captivate and entertain. Launch any content instantly using live data sources and external inputs. When the content has finished playing, regular programming automatically resumes. QL Trigger is also compatible with QL Spy when you need to launch interactive content on demand. No programming is necessary. Display wayfinding, information kiosks and other interactive applications with ease. QL Trigger can be interfaced with databases and back-end systems to launch any content. Use QL Trigger to highlight milestones and other important events in your company (call center volume, visitor count, production levels, financial statistics and more). Casinos and other entertainment venues rely on QL Trigger to display specific content when there are jackpot winners or other important event. These notices must appear on screen instantly and displace any currently scheduled content. QL Manager users can easily de-activate triggered content and resume normal programming.